Amongst stoneworts and mosses that I collected from the quarry pool at Clashmore (NC036316) on 13th April 2015 were some small invertebrates. Two lesser water boatmen keyed out to Hesperocorixa castanea, a widespread species of ‘base-deficient water, particularly at shallow margins with emergent vegetation’, which fits well. It is widespread in the north and west, but local records are sparse (from NC01 and 21). More challenging were two small mayfly nymphs, illustrated here. The abdomen bears seven pairs of very elegant gills, feather-like in outline (some are missing). I had to use the high-power microscope to see some details of the front legs, but was able eventually to name them as Leptophlebia vespertina, known to fly fishermen as the Claret Dun. 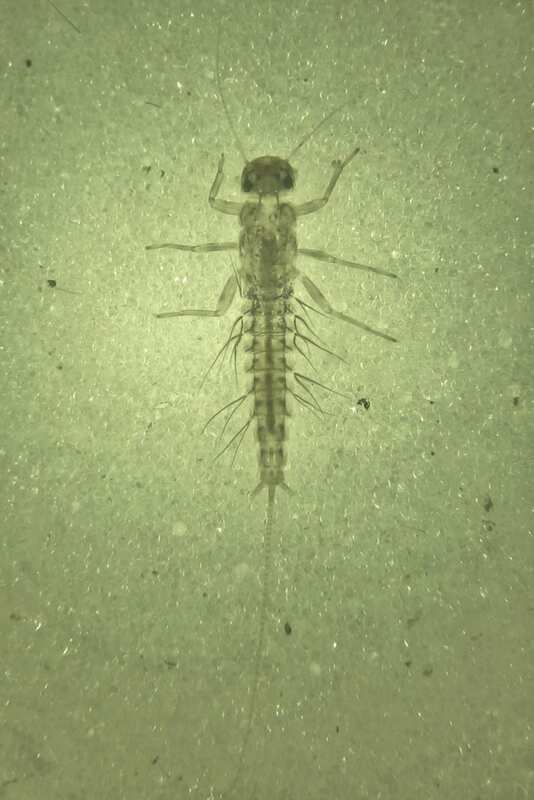 This mayfly is fairly common throughout the British Isles, especially Scotland, but local records are again few (from NC01 and 21). The nymphs are ‘poor swimmers…adapted for moving amongst dense stands of plants’, usually in ‘peaty or acidic waters; and the adults emerge between April and August. A very useful aid to mayfly identification is A pictorial guide to British Ephemeroptera by Craig Macadam and Cyril Bennett, published in 2010 by the Field Studies Council in association with The Riverfly Partnership.